Last Christmas I made these adorable and delicious (if I do say so myself!) 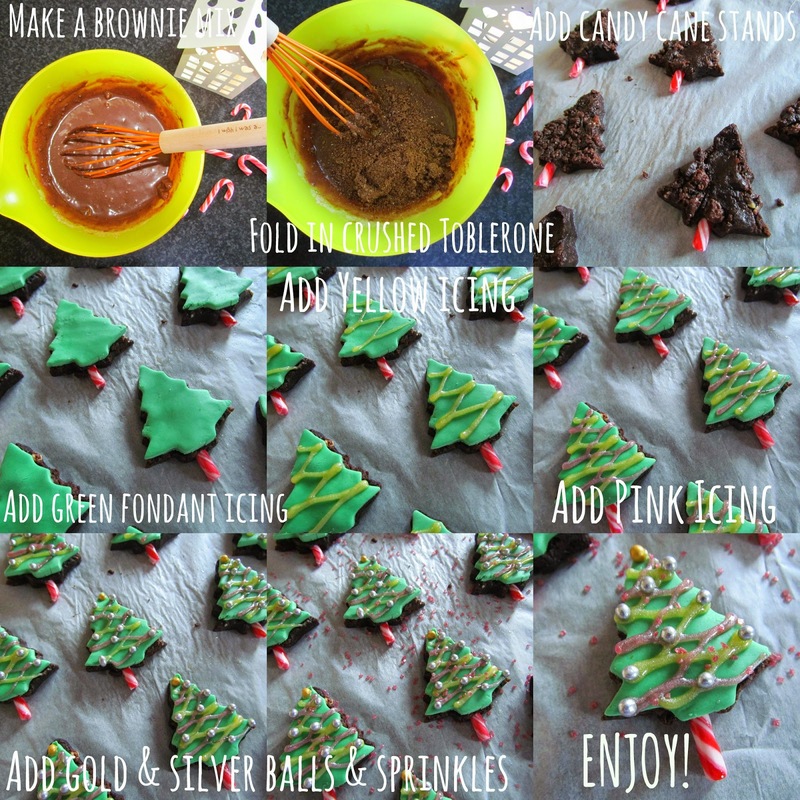 Christmas Tree Toblerone Brownies. I was originally going to make normal brownies and decorate them similar to the previous years Christmas Tree brownie effort but I decided to go that extra mile and make something a bit prettier this time around. I decided to add in the Toblerone last minute after I remembered I had put some away for Christmas, (score!) this gave the brownies a really lovely, chunkier texture and Toblerone infused throughout really made them mouth-wateringly good. These were super simple to make, even if they did seem to take an age thanks to my perfectionist nature! I did some 'lazy girl' baking and used a Betty Crocker brownie mix to make the brownies, (tut, tut I know but I only decided to bake last minute - so spontaneous!) I then cut up bits of Toblerone and put them in the blender to make them a lot smaller and smoother. I folded them into the brownie mixture and poured it into a parchment paper covered tray. I baked them for twenty minutes at 180 degrees. When done I took them out of the tray, left them on the parchment paper and put them on a wire rack to cool down. I had some green fondant icing left over from Halloween so I rolled it out with a rolling pin until it was quite thin. I then used my Christmas tree shaped cookie cutter to cut out the Christmas tree shapes. When the brownies were cool I used the same cookie cutter to cut out little brownie Christmas trees. I then cut up some red and white candy canes and stuck them in the end of the brownies to make stands for the Christmas trees. I then placed the green fondant icing on top of the brownies to create little green Christmas trees. I then used yellow and pink (I had no red) glitter icing tubes to create the look of tinsel and lights on the tree. I then stuck on gold balls for stars and silver ones around the trees to give the look of baubles. Finally I sprinkled some red candy bits over the trees to give the look of decorations on the trees - it really was that simple! I think these Christmas tree brownies look far more complicated then they actually are. They were absolutely delicious and I'll definitely be making more of these for this Christmas tooand giving some to my relatives, I think they're so pretty. These Christmas tree brownies are proof that even 'lazy baking' can make tasty sweet treats too! These look fantastic. I've pinned this to have a go at! Thank you so much! I hope you love making them as much as I did! love the idea of the candy cane as the tree trunk!